It is time for the Robot Overlord to wrench control of this site back from the slackers and the yokels and make them actually do my bidding once again! For the last 24 hours I’ve locked Stephen and Matthew in a room and told them they could only emerge when their review of Captain America #1 was complete! Previously, on Captain America: World War II was raging in the European theatre, but had not yet engulfed the United States when sickly young Steve Rogers was picked for the top-secret super-soldier project. His Vita-Ray treatments were a rousing success, but the assassination of Professor Reinstein (or possibly Erskine) made sure he was the only one of his ilk. Isaiah Bradley was part of a (mostly unsuccessful) attempt to make more super-soldiers, and his own Captain America career was nearly an urban legend for decades. 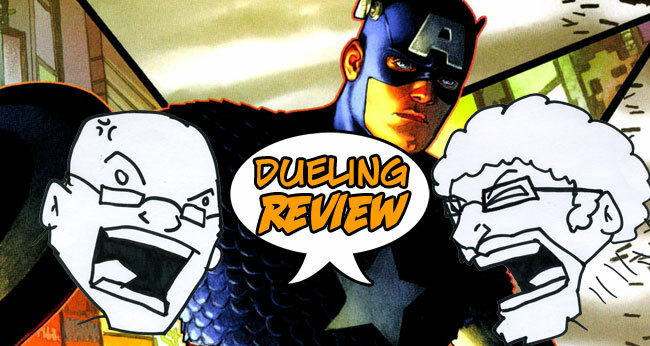 Captain America’s own legend grew like wildfire after Pearl Harbor, and his loss in 1945 was such a blow to the war effort that the government immediately drafted William Naslund (who, as the Spirit of ’76, was already active as a star-spangled super-duper) to take his place. Jeffrey Mace followed Naslund, and William Burnside was so obsessed with the icon that he allowed the government to turn him into a duplicate of Rogers, unintentionally driving him to decades of madness in the process. Young Roscoe Simons tried to uphold the shield, but was brutally murdered by the Red Skull, while John Walker was drafted to replace Rogers when his views and the views of the powers-that-be differed. After Steve Rogers’ seeming death, his own former partner, James Buchanan Barnes, took over the role, only to die in the carnage of ‘Fear Itself.’ 70 years after he first picked up the shield, Steve Rogers has once again put on his chain mail shirt to fight against injustice. STEPHEN: Can I just start by saying that, with DC making a big deal out of its DCnU relaunch and renumbering of all of its titles, it is interesting to see Marvel quietly doing the same thing with many of its books. This is Captain America #1, and just around the corner we have Ghost Rider #1, Ultimate (comics) Spider-Man #1, Daredevil #1, and so on. STEPHEN: Couldn’t have said it better myself. Of course there’s also that movie that’s coming out next month, so having Steve Rogers as Captain America might be a good thing from the marketing comic book selling standpoint. So… How ’bout that Peggy Carter biting the big one? Of course I only have a passing knowledge of Peggy thanks to our recent discussion of Nomad on the Major Spoilers Podcast. But for those who hang onto our every word, I could have sworn there was a much different relationship between Sharon and Peggy than the aunt/niece relationship mentioned here. MATTHEW: In the original continuity, Peggy was Sharon Carter’s big SISTER, who loved Captain America during the war. In 1970-something, that made Sharon a believable twenty-something, and Peggy fifty-ish. The retcon that she’s Sharon’s aunt is a concession to the slowed nature of Marvel continuity, thanks to Franklin Richards using his mighty reality-warping powers to stay young and cute forever. ROBOT OVERLORD: AH YES! FRANKLIN RICHARDS! REMIND ME TO WHIP THAT THEORY OUT OF YOU INTO AN ARTICLE NEXT WEEK! MATTHEW: Of course, it wouldn’t be a Captain America story without retconning somebody into the already packed backstory of Steve Rogers’ days in the war. It always galled me a bit that the Avengers treated Steve as a long-time veteran during his early tenure, but it’s clearly because he had AT LEAST fifteen years worth of adventures in his less-than-four-year tenure as Captain America. STEPHEN: For someone who has a passing knowledge of Steve Rogers and his sordid past, these seemed like a good place for those of the same mind to jump on board. Retcon or not, I kind of liked this story. While leaving Peggy’s funeral Dum Dum Dugan is nearly shot by someone from the team’s past… or something like that. It takes a couple flashbacks to learn what happened, which I’m sure means more changing history to align with either A) a new direction, or B) a tie-in to the movie. I must say I was half expecting to see an evil version of Peggy emerge from the shadows, but Baron Zemo? For those watching Avengers: Earth’s Mightiest Heroes, this has to get someone jazzed, right? Oh! And Hydra, too! MATTHEW: For my part, I’m wholly unimpressed with yet ANOTHER iteration of Hydra, yet ANOTHER unstoppable menace from the past, and yet ANOTHER return of an old-school villain who never really left the book. Captain America fought considerably more people than Baron Zemo, The Red Skull and Arnim Zola, although no one who has read his title since about 2003 would have much idea of that fact. STEPHEN: He did? That’s new to mean. But then again, it is ALL new to me, and I’m betting Marvel is hoping more n00bs join the fray as well. ROBOT OVERLORD: TALK ABOUT THE ART ALREADY, YOU FOOLS! STEPHEN: Yeah… so… the art. I didn’t mind it, though the extra lines on faces, just to give the renderer something to add more computer generated shading to, wasn’t a big thrill for me. The layout seemed a bit odd at times too, almost like Steve McNiven started out wanting to go one direction, but halfway through gave up and switched back to the 5 or 6 panel layout per page. When the action got intense, I liked how the panel shape and layout changed; it worked, but it felt unnatural. MATTHEW: I’m not feeling Steve McNiven’s art this issue… Characters look suddenly frantic for no reason, expressions don’t match the dialogue, and Steve Rogers looks completely insane in several panels. His 1940’s scenes aren’t particularly believable, and Sharon Carter changes her entire facial structure several times during the issue. I like the chase sequence, but all in all, this reminded me of a some of the better work coming out of Wildstorm right before the turn of the century: polished, computer-colored and rendered to death, but not overwhelming in its inspiration. STEPHEN: To be honest, this isn’t the first time I’ve read Captain America. 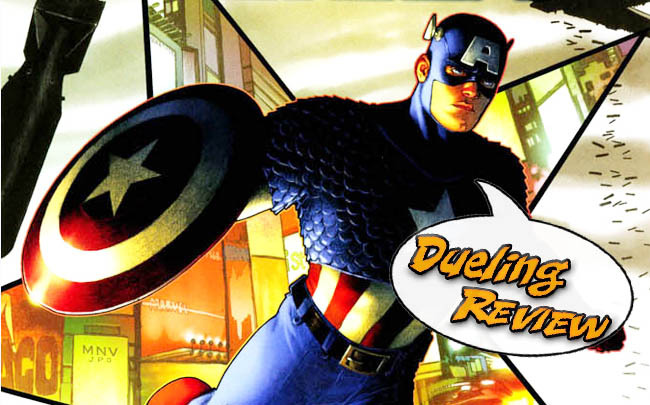 As mentioned previously, we read the Nomad storyline, and we spent a fair amount of time a few years ago discussing in detail Ed Brubaker’s last huge run on Captain America. I think it was his name that had me interested in reading what he was going to do next, but after this first issue I’m torn. I do (and probably will) continue to pick up this series at least through the first arc, but I’m afraid anything further than that will remind me why I ended up not caring for the Brubaker run the last time. 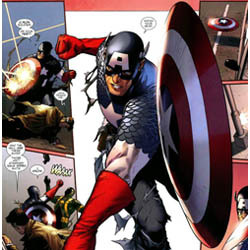 MATTHEW: Ed Brubaker kicked off the last volume of Cap in 2005 with what was clearly a long-term, deeply personalized story. From the very first issue, it was pretty clear that something new was in the offing for Steve Rogers, building up through the resurrection of Bucky, the assassination, the replacement and return. It seemed like a story that Brubaker had waited a while to tell, and one that struck me as new enough to not feel predictable, but recognizable as a story based on years of Captain America continuity. In short, it was a great jumping-on point. Unfortunately, this #1 feels like a manufactured event to coincide with the release of the movie, a purely mercenary attempt to make sure there’s something that fans recognize from that film when they theoretically decide to slip into a comic shop and find out more about this “Cap’n ‘Murrica” feller. It doesn’t hold up for me, though, feeling like I’ve seen it all before, and failing to wow me with either art or story, even though I’m a large fan of the writer and at least casually entertained by the artist’s work. ROBOT OVERLORD: Very well meatbags! You have met your obligations this week, and will live to see another day. For the rest of you, did this issue hit it on the head over everything that a Captain America story should be, or do you feel like this is something that has been done before? Also: Why is Captain America apparently FLYING on the cover? Jumped of a plane, Mr. Peterson. Are you not entertained? Um. Which Captain America? In which universe? In which continuity? 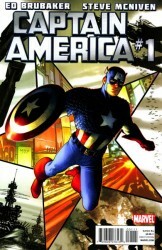 And why is Captain America apparently flying on the cover? Does Robot Overlord have a Hero(villian? Tyrant?) History? I believe there was a Major Spoilers Podcast done with him a year or so ago… I wasn’t there, as it was Matthew who interviewed him. I love the Robot Overlord interview! I forgot about it until you mentioned it. I’d like to see the ‘3 year old’ interview the Robot Overlord next time though. It would be pretty amazing.